Explore the very best of the Western Cape on this Where Oceans Meet Escorted Tour. After taking Saga’s included UK door-to-door travel service to the airport, fly overnight to Cape Town. Spend the day touring the Cape of Good Hope Nature Reserve and Cape Point, Africa’s most south-westerly corner. 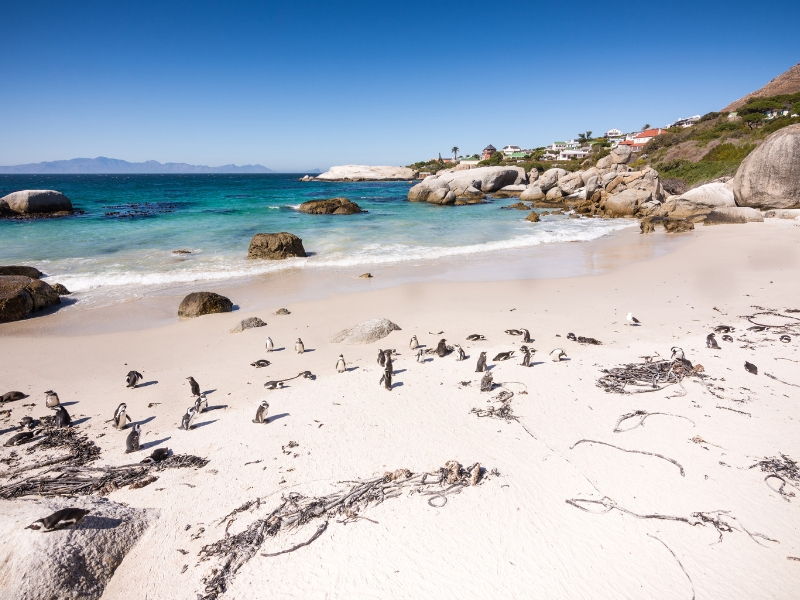 Visit Boulders Beach where 2,500 African penguins await you, then historic Simons Town, steeped in naval history. This cosmopolitan city has plenty to explore independently. Or, join an optional half-day tour taking in the Company’s Garden park, St George’s Cathedral, the South African Museum, the Parliament Buildings, the pastel-coloured homes of the Bo-Kaap and a cable-car ride to the top of Table Mountain (weather permitting). Continue to the town of Somerset West, which is overlooked by the Helderberg Mountains in the heart of the winelands, where you’ll spend two nights at the locally rated 4-star NH The Lord Charles. This afternoon enjoy an included excursion historic Stellenbosch, second oldest town in South Africa, where the Dutch East India Company legacy shows in the architecture. Depart Somerset West, heading via Route 62 for Albertinia. This afternoon look forward to an included game drive. Stay tonight at the locally rated 4-star Garden Route Game Lodge which lies against a backdrop of the Langeberg mountains and at the start of the coastal Garden Route. Perhaps join an optional game drive. Depart for the ‘ostrich capital’ of Oudtshoorn via Route 62. Stay two nights at the locally rated 4-star Queens Hotel. Visit the Cango Ostrich Farm and discover this famous home of the largest bird on earth. Explore the tunnels and vast caverns of Cango Caves, on a fairly strenuous excursion. Stop for a cruise on Keurbooms River with a picnic lunch, taking in the nature reserve known for its bird life. Continue to Plettenberg Bay and stay two nights at the locally rated 4-star Whalesong Hotel & Hydro. Visit Storms River Mouth in Tsitsikamma National Park, a conservation area of ancient forests, waterfalls and gorges, and enjoy outstanding views from the suspension bridge. Depart for the seaside village of Arniston, stopping en route in Knynsa, a scenic town set beside a lagoon. Spend the next three nights at the locally rated 4-star Arniston Spa Hotel. This morning enjoy a full day included tour of Cape Agulhas – Africa’s most southerly point, where the Atlantic and Indian Oceans meet and many ships have been wrecked. Find out more at the Shipwreck Museum in Bredarsdorp.